Breathing at the ocean. Best place to let it all go. This one is often considered to be one of the most helpful ways to breathe if you want to calm the eff down quickly. I don’t know if there’s any particular name for it. Some refer to it as the “7-11 method” or the “4-7-8 method.” Whatever you call it, the goal is to simply exhale for longer than you inhale. In the “7-11 method,” you breathe in for a count of 7 and out for a count of 11, making sure the breath is the same length on each count. In the “4-7-8 method,” you breathe in for a count of 4, hold for a count of 7, and breathe out for a count of 8. It might be difficult at first because we aren’t used to breathing like this. So do what you can. It doesn’t matter if you follow either of the methods above, as long as your out breaths are longer than your in breaths. You can breathe in for a count of 2 and out for a count of 4 if that’s easier to start with. Like anything else, find a rhythm that works for you. 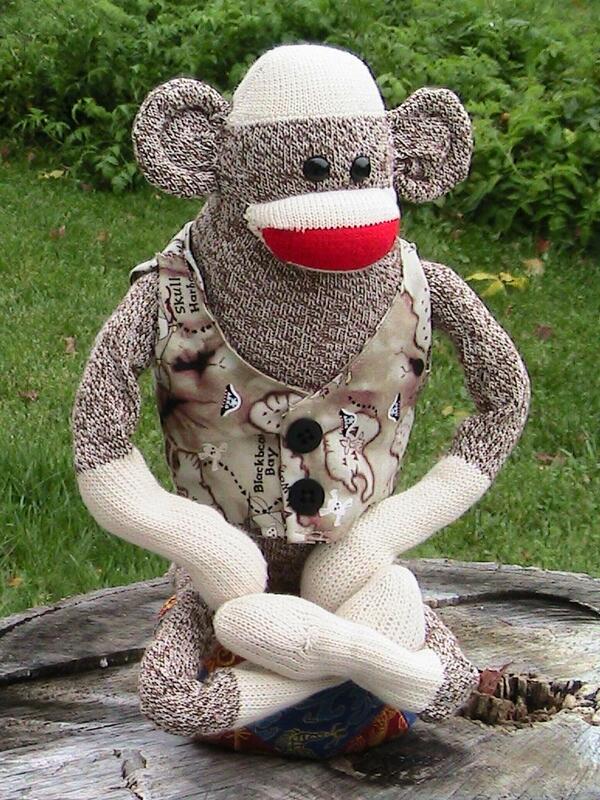 Sock puppet monkey practicing breathing. When you exhale for even a few counts longer than you inhale, the vagus nerve (This runs from your neck down through your diaphragm.) sends a signal to your brain to increase your parasympathetic nervous system functioning and decrease your sympathetic nervous system functioning. The sympathetic nervous system is in charge of your fight or flight response, and when that’s on fire, your heart rate and your breathing speed up, and stress hormones (Good ol’ cortisol for one.) start pumping through your bloodstream, preparing your body to face the threat. If there’s an actual threat, this is helpful. But since we aren’t often chased by wild lions, most of our “threats” are more like running late to work or having had a fight with our significant other. In these non-life-threatening situations, amping up your sympathetic nervous system isn’t helpful, and you do this too much, it’s actually damaging. When cortisol is elevated for too long it throws off your hormonal system. Over time, best case scenario you gain weight, worst case scenario you die. Seriously. Prolonged stress loves causing heart attacks. On the other hand, the parasympathetic nervous system is your grandmother. It’s in charge of your rest, relax, and digest response. When the parasympathetic system is more active, your breathing slows, heart rate drops, blood pressure lowers as the blood vessels relax, and you calm the eff down. So much winning ! In the short term you feel better and in the long term, it allows your body to heal. Only best case scenarios here, no one dies (at least not prematurely) and we lose weight. So that’s that. Try to breathe this way for at least five minutes so you can notice a difference. Now, I’m going to publish this so I can get my five in before my next activity.